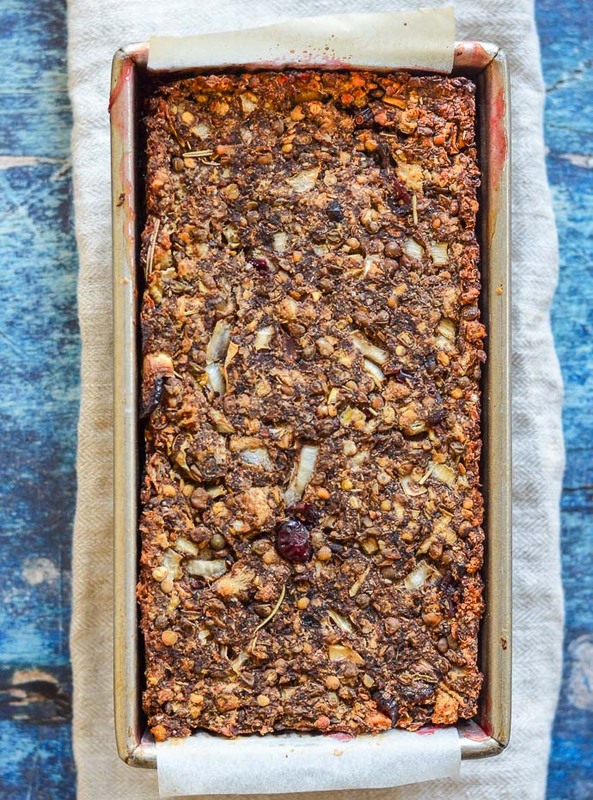 A fresh take on a Vegan Lentil Loaf for you! 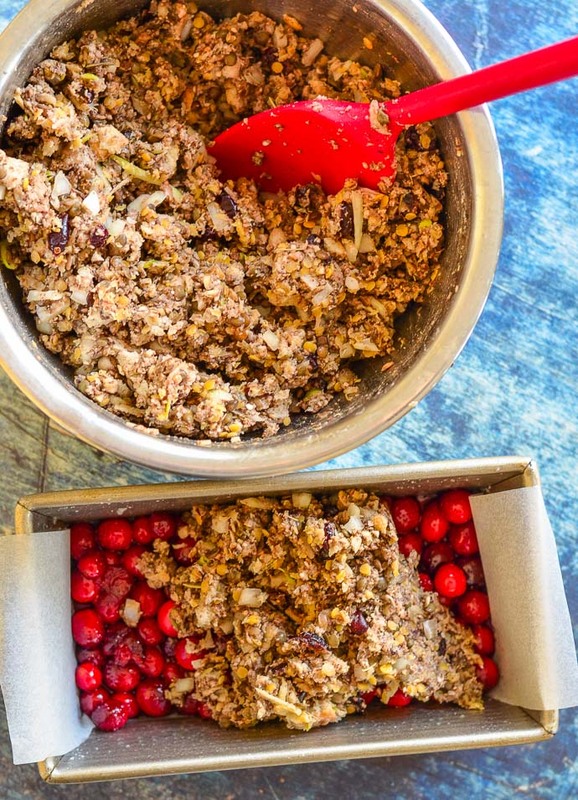 It’s made with a delicious blend of lentils, mushrooms and walnuts and has a beautifully festive cranberry topping. Those pops of juicy cranberry in every bite are so good, plus they make it look pretty impressive. It would make a great centrepiece on your holiday table! Ah, it’s nearly Christmas! It’s only gone and crept up on me yet again. It happens every year. I think I have loads of time and then all of a sudden that time slips through my fingers and it’s here and I’m in a mad panic to get everything organized. Because it’s the festive season, and it’s always super busy, I am always in need of recipes that feel festive but aren’t too difficult, and bonus points if they can be prepared ahead of the big day. 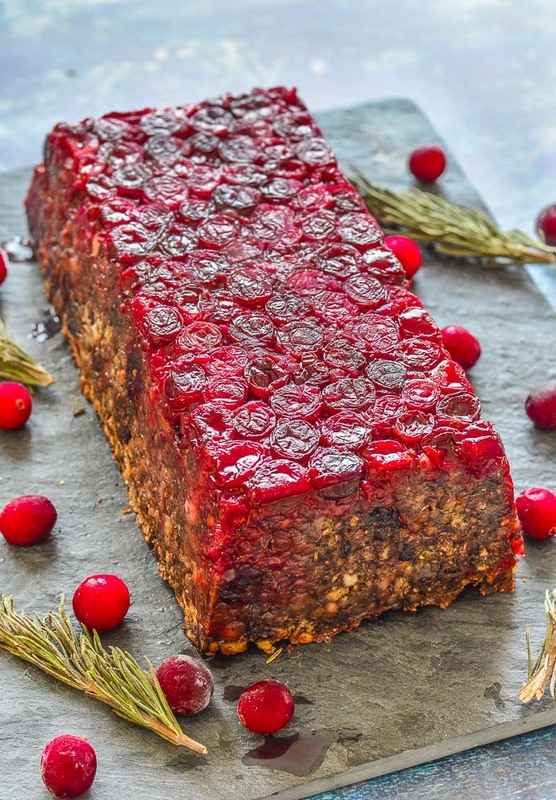 And boy have I got all those points covered with this Mushroom Lentil Loaf with Cranberries recipe. 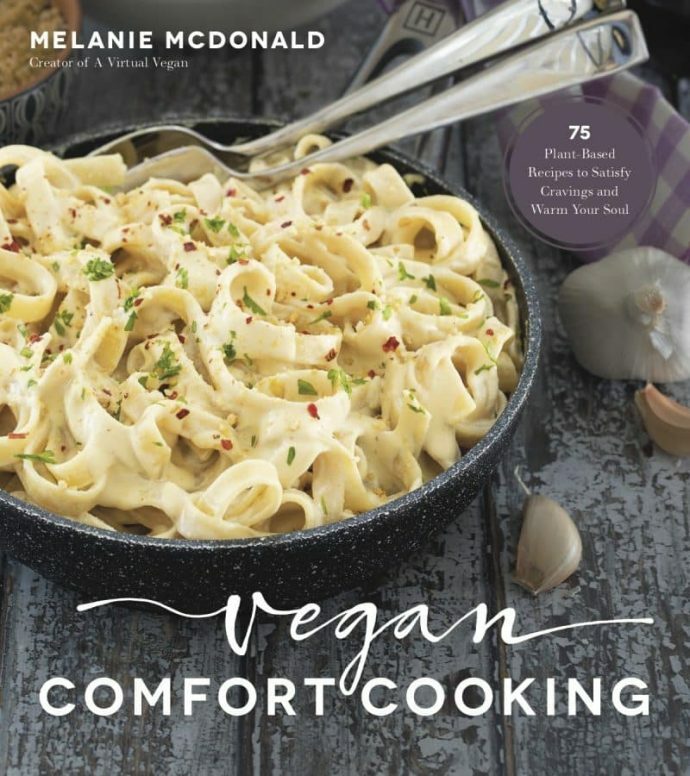 It’s so good I’ve even included it in my Vegan Christmas Dinner Menu, Shopping List and Timeline. If you want your entire Christmas meal planned down to the tiniest detail for you then go check it out. This new vegan meatloaf recipe is an adapted version of my very popular Vegan Meatloaf with Gravy recipe. 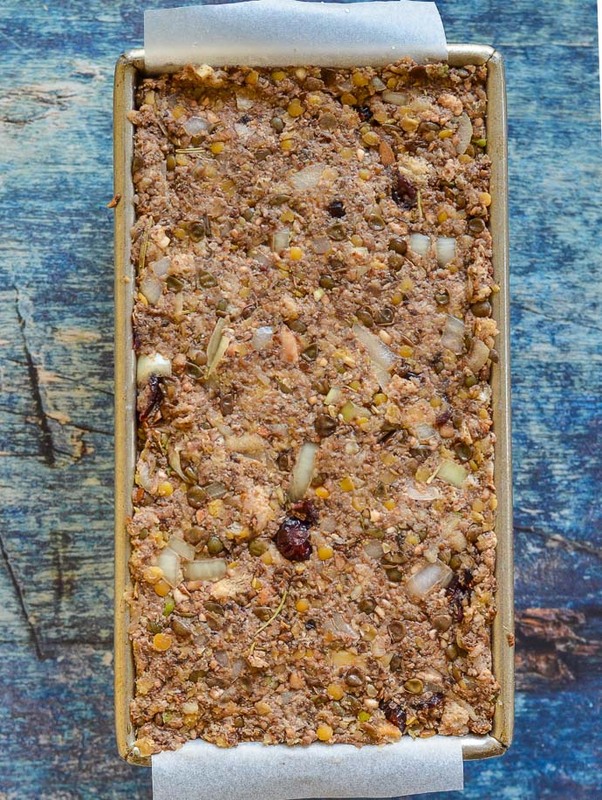 If you have tried that and loved it then you will love this new Lentil Loaf too. 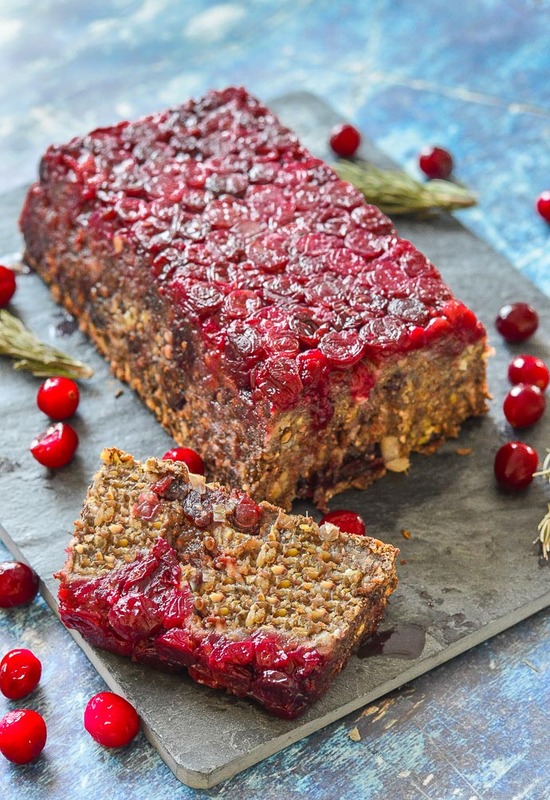 The Mushroom Lentil Loaf with Cranberries just screams festive. 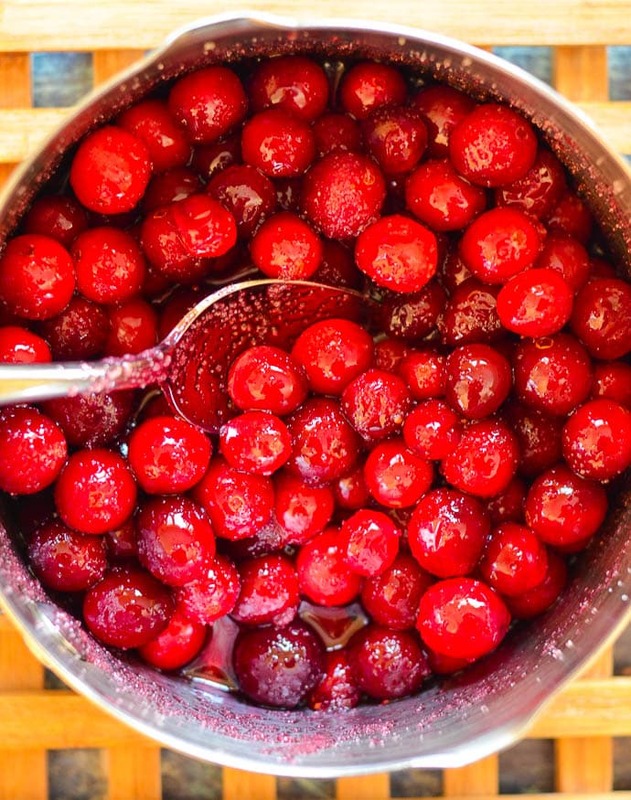 The juicy red cranberries make it look so pretty, plus those juicy pops of cranberry in every bite are so good. As well as cranberries on top, there are dried cranberries through the actual body of the Lentil Loaf. 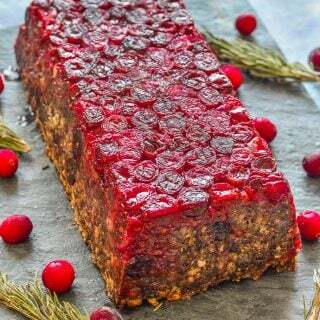 They add a lovely chew and a little sweetness which is really good with the savoury loaf and the slightly tart cranberry topping. What’s great too, is that because of the cranberry topping, you don’t need to serve cranberry sauce on the side so there’s one less thing to make and remember to put on the table. 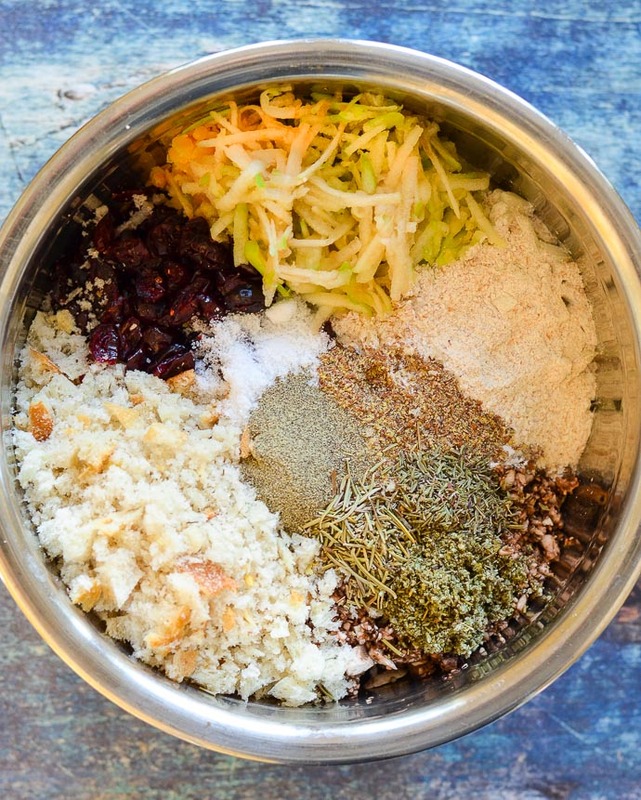 This recipe involves quite a lot of chopping, but if you have a food processor it can all be done in minutes. When I make this recipe, just about the only thing I use a knife for is cutting the ends off the onion and peeling it. Everything else just gets thrown in here and pulsed until finely chopped. It couldn’t be easier! 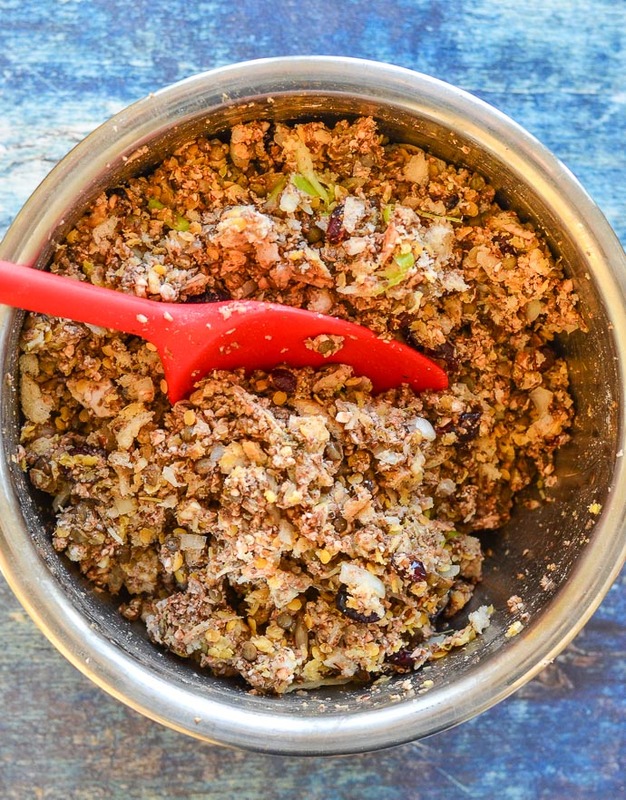 First chop all of the vegetables and walnuts then add them to a large mixing bowl with the lentils. 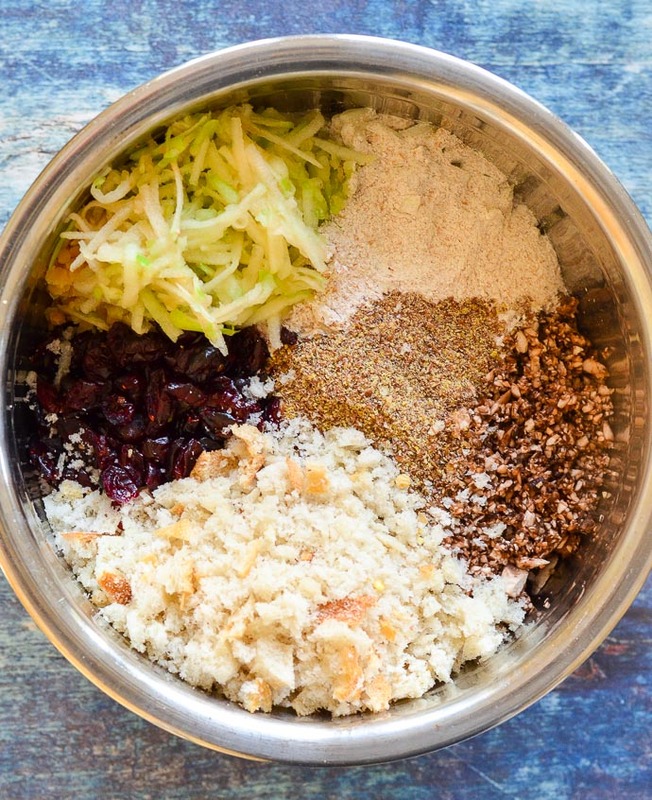 Then add the breadcrumbs, ground flax, flour, grated apple and dried cranberries. Then the seasoning, herbs and tamari. Then mix it all up thoroughly. Put some cranberries and sugar in a pan and warm over a medium heat until the sugar is starting to melt and they are beginning to just get juicy. 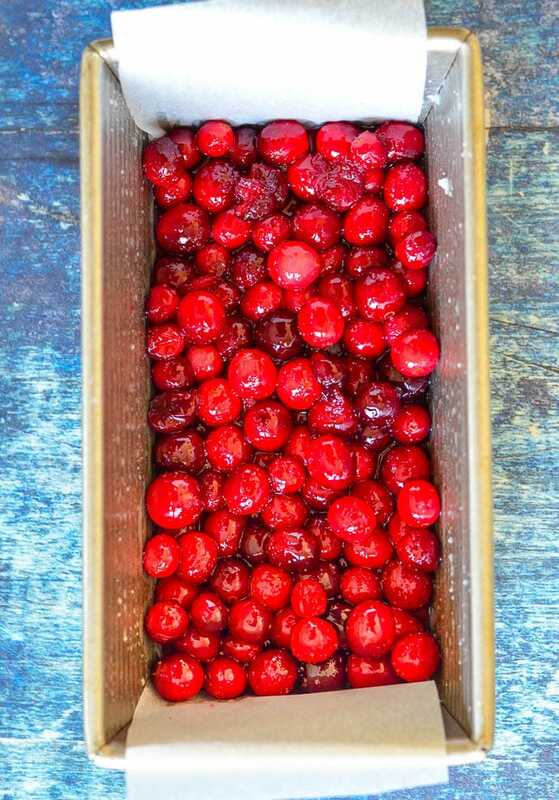 Line a loaf pan with a strip of parchment paper and pour in the cranberries. Then pile on the Lentil Loaf mixture and pack it in very tightly. At this stage it can be refrigerated for a couple of days or baked right away. Once ready, it’s best to leave it in the tin to rest for 15-30 minutes. You will find that it cuts much better if you do this. 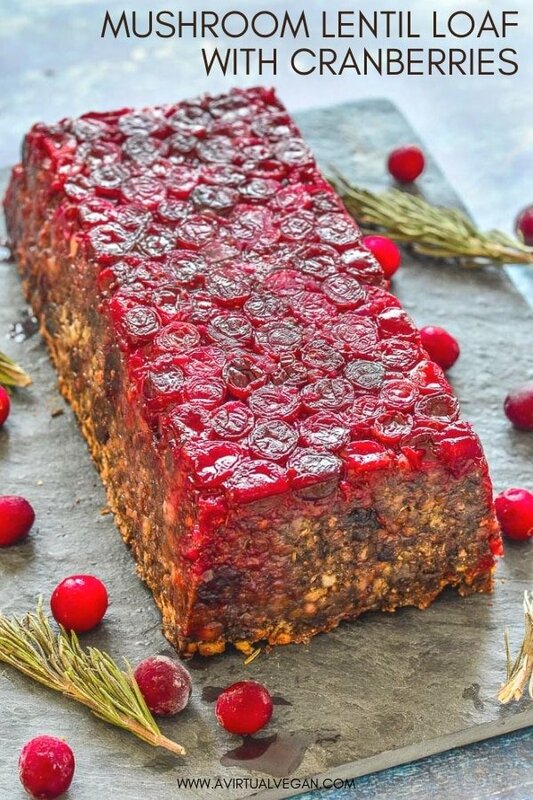 This Mushroom Lentil Loaf with Cranberries will make a wonderful addition to your Christmas or Thanksgiving meal, or just for a regular dinner. I love to serve it with my Healthy No Oil Roasted Potatoes, steamed vegetables and lashings of gravy. 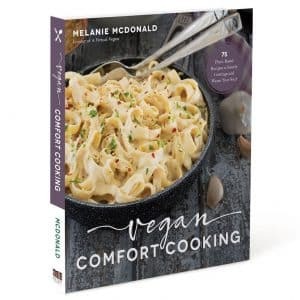 It works really well with the gravy from my original meatloaf recipe here and also with my Red Wine Vegan Gravy. It’s also awesome served with fluffy, buttery mashed potato or simply with lots of vegetables on the side. It looks so pretty and festive! A fresh take on a Vegan Lentil Loaf for you! It's made with a delicious blend of lentils, mushrooms and walnuts and has a beautifully festive cranberry topping. Those pops of juicy cranberry in every bite are so good, plus they make it look pretty impressive. It would make a great centrepiece on your holiday table! Spoon in the cranberries (you don't have to wait for them to cool down but be careful as the sugary liquid will be very hot) and even them out a bit with a spoon. Once done, leave to rest in the pan for 15-30 minutes (it will stay warm for up to an hour if you wrap it in some tin foil) before turning out and slicing. To turn it out, put a plate or board on top of it then flip it over so the plate/board ends up on the bottom. 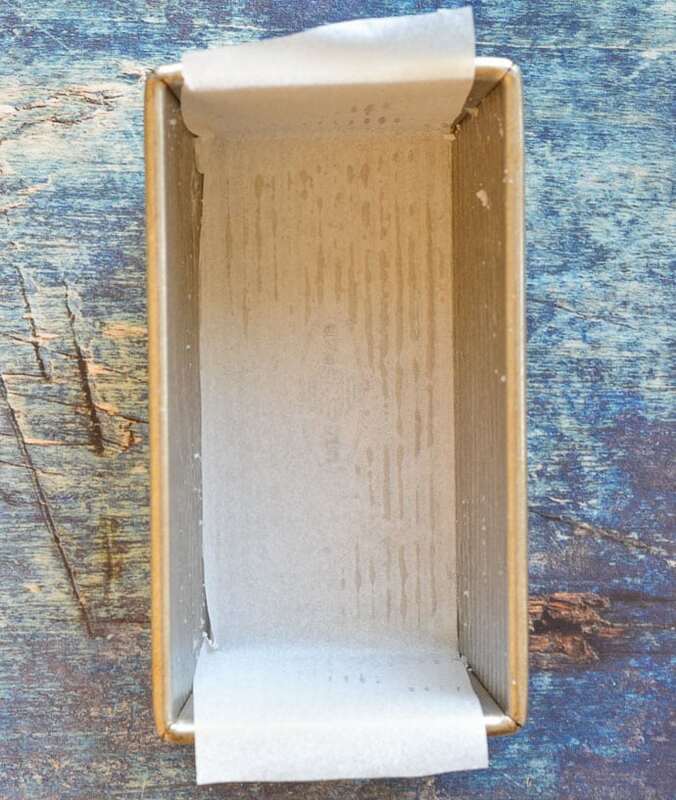 It will slide out really easily but if you do have any trouble you can give a little tug on the parchment paper to ease it out. Once it's out, gently peel back the parchment paper to reveal the pretty cranberry top. Don't soak them prior to cooking. Any leftover cooked lentils will keep for 5-6 days in a sealed container in the fridge and they also freeze really well. 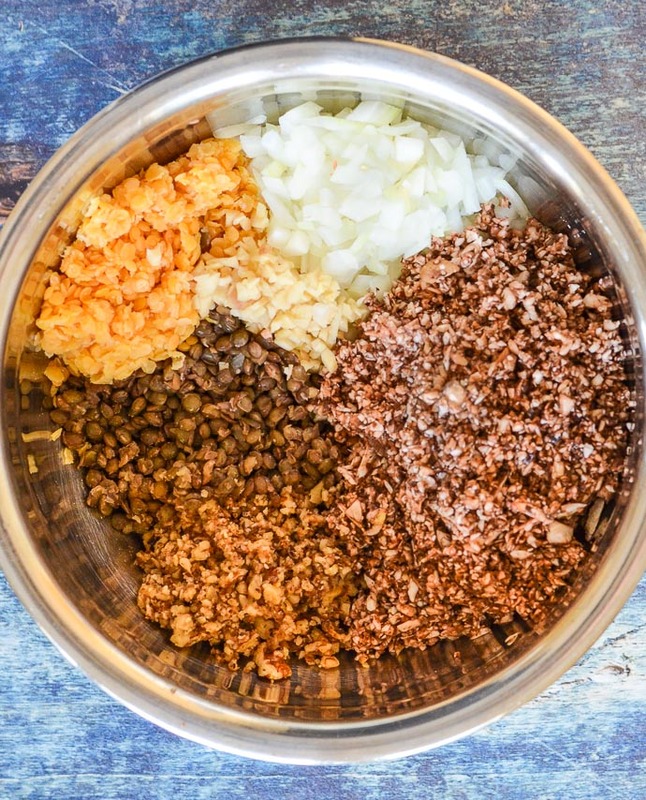 If you want to make the Lentil Loaf ahead of time, follow the instructions up to packing it into the pan, then wrap it well and refrigerate for up to 3 days. It will need an extra 10 - 15 minutes in the oven to compensate for it starting off very cold. If you cook the loaf then for some reason don't get around to eating it, it will keep in the fridge for up to one week and can be reheated in the pan in the oven. It will take about 30 minutes (or until piping hot) on 375°F. Lentil Loaf leftovers can be stored in the fridge for up to 1 week. Wrap in tin foil and oven bake to reheat, or pan fry individual slices. When pan-fried it develops the most gorgeous crust and it's so good!